Any home or business can easily and quickly fall victim to a serious mold infestation. The nature of mold growth allows mold to grow virtually anywhere. All mold requires to thrive is an adequate water source, organic matter to feed on, and comfortable temperatures. Mold loves the warmth of room temperature and is just waiting to feast on all the delicious cellulose-based building materials (wood, drywall, wallpaper, etc.). The moment a water source is introduced, it only takes 24-48 hours for mold to start spreading throughout your property. If mold is given the opportunity to colonize your home or business, it will eat away at your property and compromise the structural integrity and property value. In addition, exposure to mold could lead to health issues ranging from symptoms as mild as common allergy symptoms to severe respiratory issues. Mold can be very unfamiliar territory for your average home or business owner. As a result, uncovering prolific mold activity can easily overwhelm property owners. Mold should always be approached with a sense of urgency. The most effective way to protect your family and property from further damages and costlier repairs is to complete a professional Barrington, NJ mold inspection immediately. Even if you are unsure if it is, in fact, mold, a reputable mold professional will be able to help you make that differentiation and provide you with a peace of mind. In order to provide you and your family with the utmost safety during and after the mold inspection and mold remediation process, MasterTech has established a Barrington, NJ mold removal process that integrates the safest, most effective, and most efficient industry techniques. We have seen the nightmares families go through when they fall victim to a poor or improper mold remediation. MasterTech is dedicated to making sure each of our clients receive a high quality service, in addition to very honest advice. Often times, Barrington, NJ homeowners are weary of mold remediations because the assumption is that their home will be blasted with a copious amount of harsh chemicals. Homeowners tend to fear that, while the mold is gone, they will be returning their family to a chemical-ridden home, unfit for safe habitation. MasterTech has taken all measures to ensure you and your family will be returning to a mold-free and safe home. For each mold remediation in Barrington, NJ, we use the safest methods available, and we are constantly researching newly developed methods, to ensure that our process stays the safest, most effective, and most efficient. We use modern oxidative technology, which is, currently, the safest approach in the industry. Mold is a bio-contaminant that requires a unique decontamination protocol designed specifically to remove and prevent its growth. The use of oxidative technology for mold remediation has revolutionized the mold industry, offering restoration companies a safer alternative to the hazardous methods developed in the 1980s. The oxidative remediation process has been proven to be more effective at removing bio-contaminants than any other remediation method available in the industry today. Not only is the process more effective, it is also environmentally safe. The process does not require the use of powerful pesticides and there are no dangerous residual chemicals or heavy metals remaining after remediation. Through the use of oxidative technology, MasterTech Environmental can confidently promise you the safest, most effective, and most efficient mold remediation. 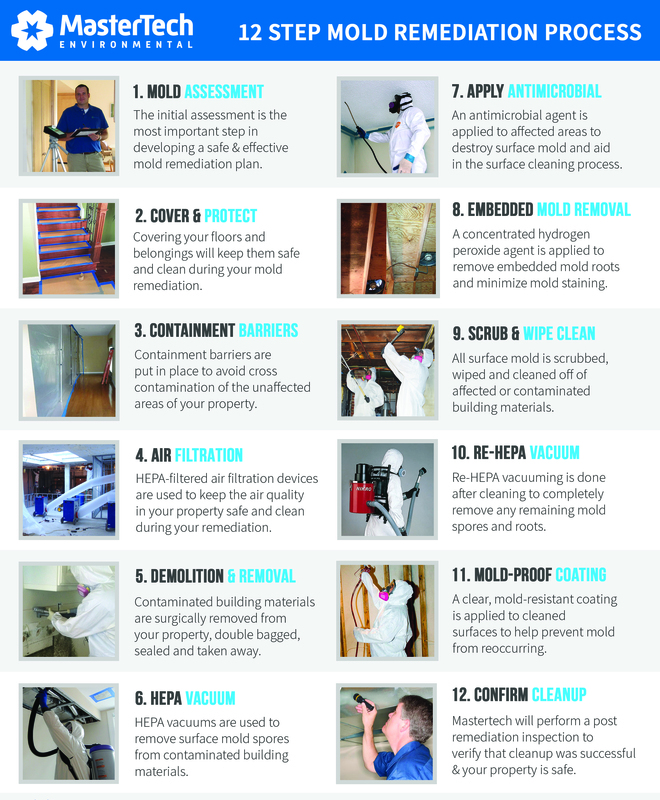 Every MasterTech mold remediation is backed by a 5 year mold-free warranty. Our priority is that we did the job right for you and your family the first time. To ensure a job done right, we always complete post remediation verification testing to confirm the work. Mastertech Environmental is certified to perform mold removal and restoration. If you need mold removal in Camden County, NJ, call MasterTech Today. If you are looking for a professional comprehensive mold inspection in Laurel Springs, NJ or a safe, effective and affordable mold removal in Merchantville, NJ, we are the team for you.